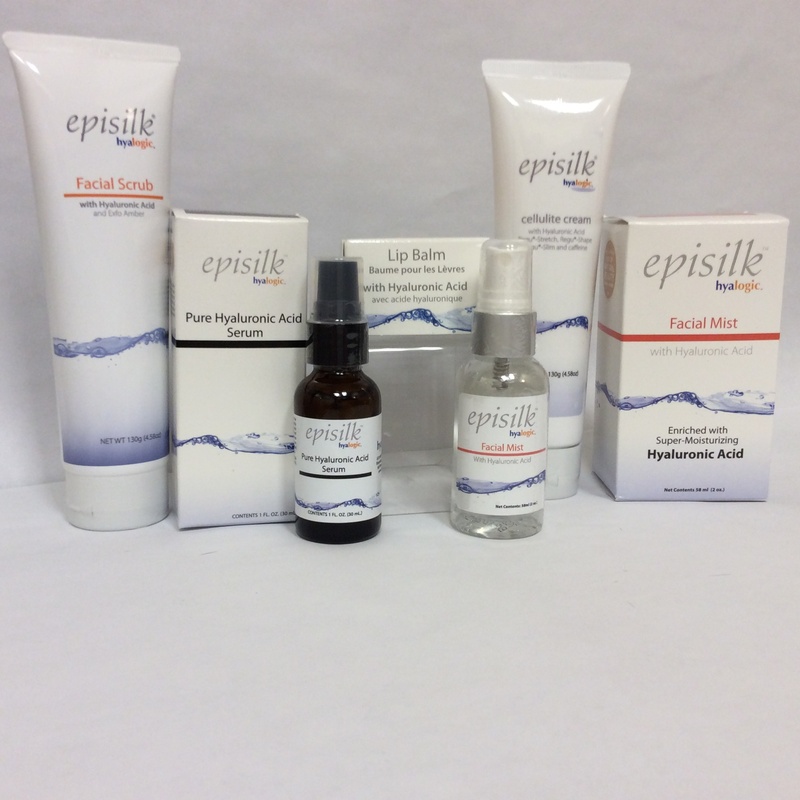 This past weekend, Essential Formulas traveled to Anaheim to participate in the Natural Products Expo West trade-show. I have never seen so many natural products fanatics in one place… over 100,000 to be specific. While it was impossible to try and visit every booth, I made the rounds a few times and picked up some exceptional products that I will continue to use beyond the weekend at the expo. It never fails… I get sick at every single trade-show. This time was no different. The first day we arrived I started to get a sore throat and feel my lymph nodes expanding. However, I decided to fight it with everything I had and I told my body “NO!” you will not get sick this time! I honestly don’t believe I would have gotten out of bed much less enjoyed the expo without the following products. I don’t think it was a coincidence that our booth was located right in front of Emergen-C and right beside North American Herb & Spice. Combined with Dr. Ohhira’s Propolis product, these products allowed me to not just skate through the expo wanting to collapse afterwards, but to actually feel healthy and well! Emergen-C is a powder packed with vitamin C, D, B, and many other healthy supplements that you mix with water. I honestly felt better after every bottle I drank. Just one packet gives you 1000mg of Vitamin C and Zinc as well as 1000 IU of Vitamin D. And besides its benefits for your immune system, it tastes good! The next product did not taste so good… but it worked like a miracle. North American Herb & Spice’s Oil of Oregano absolutely rocked my world. After using it just one time, I could start to feel my lymph nodes draining. I tried to take it straight the first couple of times, but I just couldn’t handle the after-taste. However, mixing a dropper full in with a glass of orange juice or a bottle of Naked juice solved the taste issue. I literally felt better after every time I drank it. 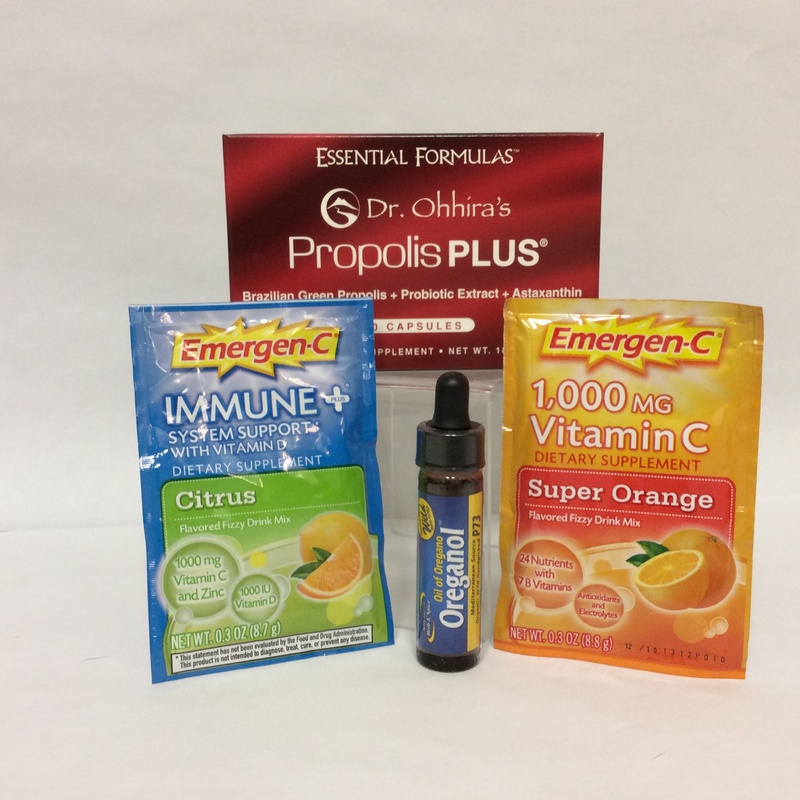 By the end of the weekend, I no longer had a sore throat or swollen lymph nodes, and I primarily attribute that to this “miracle elixir.” My final health savior was Dr. Ohhira’s Propolis Plus, a supplement including probiotics and packed with antioxidants.. While the former 2 products kicked in for immediate relief, this product promoted my long-term health and wellness. I am no longer taking the other 2 products, but I continue to take this product daily and know that I would relapse without it. If you have been reading my blog consistently, you know about my beloved French Bulldog puppy, Nellie. As I was walking the halls at the expo, I spotted a booth called “Nellie’s” so of course I had to check it out. Their logo was a blonde girl holding a French Bulldog named “Nugget” (one of Nellie’s nicknames), so I bought some of their natural home cleaning products to try out. 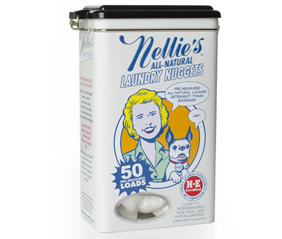 I used the laundry nuggets when I got home to do several loads of laundry and they all came out smelling fresh and clean. I will definitely continue to use their laundry products, and not just because of the name of the brand. Speaking of Nellie, I also picked up some all-natural carpet cleaning products, since she tends to have about 2000 accidents a day. 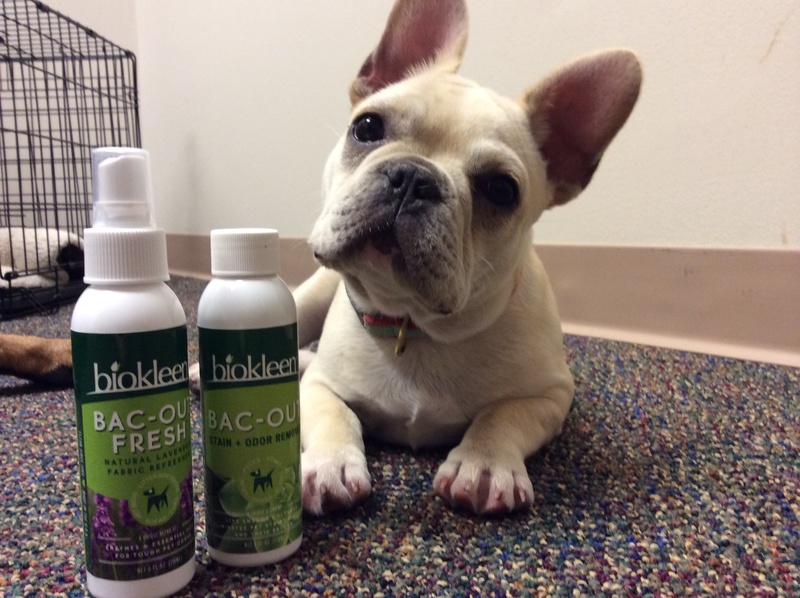 This product called Bac-Out is by Biokleen, and contains live enzyme cultures to eliminate pet stains and odors. Don’t use anything without enzymes to try and clean up pet messes. Bac-Out smells clean, but not like perfume, and doesn’t just mask the smell, but actually gets it out. This product will from now on be a staple at my crazy-pet household. Luckily for me, I got to walk around with beauty-guru Kelly Charles, who directed me to the best of the best in the beauty and body care departments. In high school, I endured a lot of ridicule for smelling like a “gordita.” AKA I stank! I literally tried everything, even prescription strength deodorant, but nothing could get rid of the “gordita” smell. I think I have finally waved goodbye (without sweat marks) to my stinky past and moved onto smelling like a fresh woman. 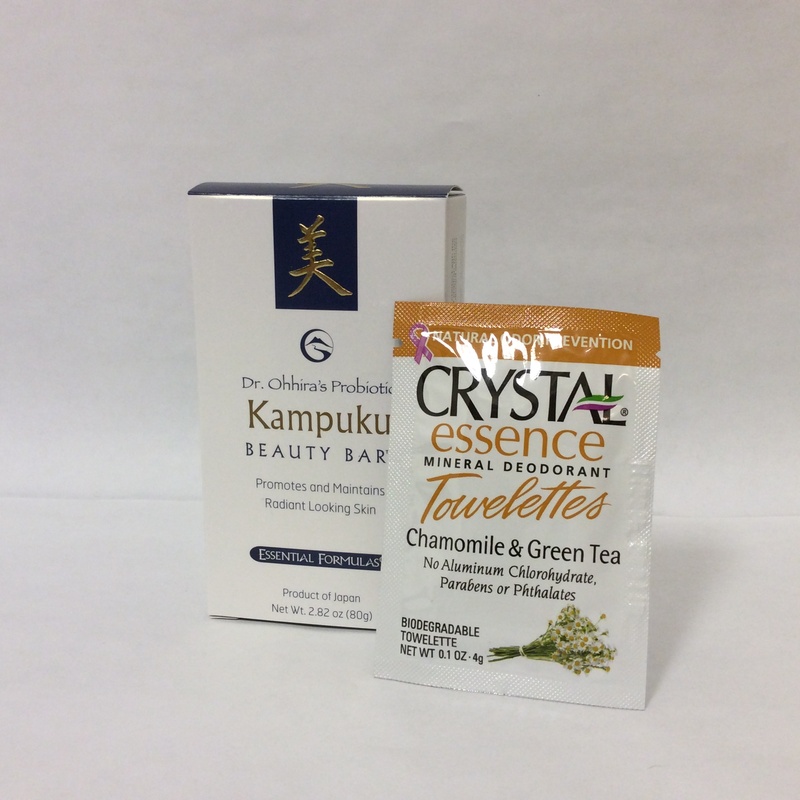 For the first time, I tried Crystal Essence Mineral Deodorant Towelettes in combination with Dr. Ohhira’s Kampuku Beauty Bar soap, and I can unashamedly lift my arms without causing everyone around me to pass out. I use the Beauty Bar in the shower and the towelettes when I get out, and I stay smelling clean even after workouts. Not only do these products help me physically, but they put to rest my “gordita” high school reputation (I can’t believe I’m confessing this online!). My other favorite booth in the personal care department was Hyalogic. These products have completely changed my skincare regimen within just a few days. Although I obsess over skincare, I often get lazy and neglect taking care of my face. I also am notorious of switching products and never truly sticking to a regimen. I am so happy to finally have my skin care process down, and the answer I found was Hyaluronic Acid, a substance found naturally in the body. Lately, there has been a lot of buzz about Hyaluronic Acid being used in anti-aging products, and it has even been promoted by some as “the fountain of youth.” My Hyalogic skincare process goes like this: Facial Scrub in the shower, Pure Hyaluronic Acid Serum after washing my face, Facial Mist throughout the day to moisturize and stay fresh, Lip Balm every time I remember it, and Cellulite Cream before bed. Most exfoliates should only be used 2-3 times a week, but this Facial Scrub is gentle enough to be used daily, which I love. I am going to save my favorite natural foods from Expo West for another post, but I can assure you there are lots of new, natural, organic food products on the market that you will love. In the meantime, do yourself a favor and check out these great products.